The Aluminum-Titanium material allows the construction of light weight, elastic Log-Periodic antennas which - at the same time - provide low wind loads. Log-Periodic antennas cover a wide frequency range without switching elements and are fed with just a single coax cable. Gain, bandwidth and front to back ratio remain constant over the entire frequency range - in contrary to monoband or trapped yagis. 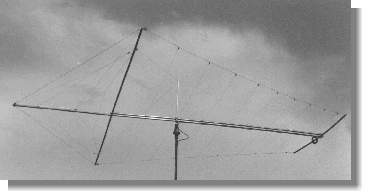 No traps or other loading techniques will limit the useful output power to the antenna. We use a double-boom feeding technique and a new kind of element to boom mounting. Special cross clamps provide a large contact surface for excellent RF-performance. The crossing of elements is executed by the double-boom. The applied transmitting power is mainly limited by the power capability of the coax cable. Due to the double-boom the input impedance of the Log-Periodic antenna can be directly matched to the feed line. Additionally, the double-boom gives the antenna extreme horizontal and vertical stability. No drillings weaken the mechanical stability of the boom! 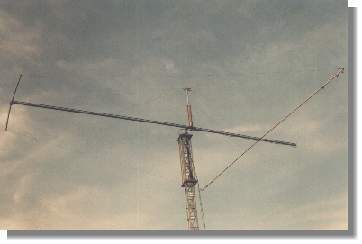 Loss-free linear loading feeding on 10MHz, full-size rotary dipole on 7MHz, rotary shortened dipole on 3.5MHz through use of TITANEXHigh-Q-coil TC100. 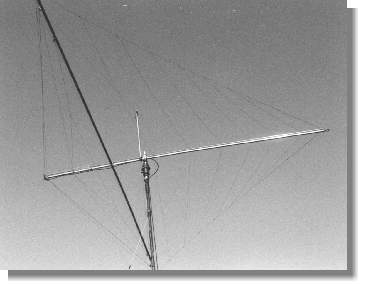 The rotary dipole for 80 can either be tuned to 80m CW or 80m SSB.